We recognize the important role of technology in the classroom. 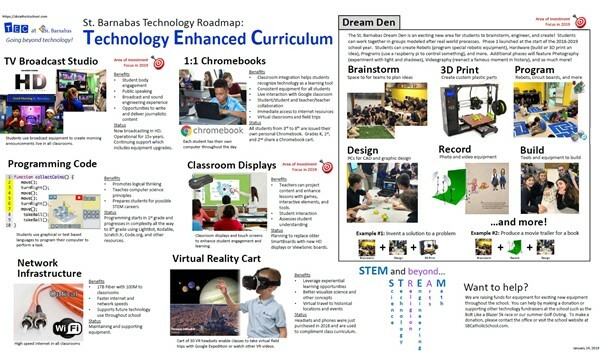 St. Barnabas promotes the concept of a Technology Enhanced Curriculum. We want our students to not only understand how to use technology, but when to use it. Technology is a powerful tool that promotes progress and learning and will be an important skill for higher education and future careers. Our school remains focused on using technology is this important context. Chromebooks - Every student in 8th grade down to 3rd grade is issued their own personal Chromebook. Students in 2nd to Kindergarten have periodic access to Chromebooks via a classroom cart. Students and teachers leverage tools in the Google for Education Suite to enhance classroom projects. 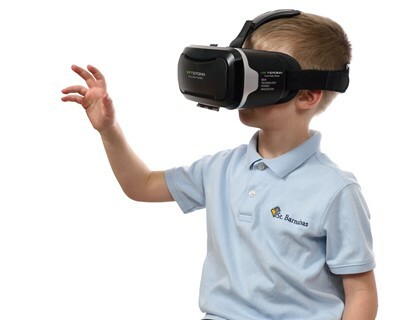 Virtual Reality Cart - In January 2018, the school added a cart of 30 VR headsets. Classes use these to watch immersive VR videos and go on virtual field trips using Google Expeditions. Students visit far away places, learn about historic events, see science come to life, and even learn more about possible careers by looking into the day in the life of an occupation. Interactive Boards - Classrooms are equipped with ViewSonic boards, SmartBoards, or other high definition displays. The interactive touch screens and displays enhance student engagement and learning. 3D Printers - Students have access to 3D printers to create custom parts and encourage knowledge of STEM (science, technology, engineering, and math). Programming - Students write and execute code to program their computer to perform tasks. Basic programming start in Kindergarten and 1st grade. Document Cameras - Classrooms utilize document cameras to project science experiments, review written assignments, and look at things that may otherwise be too small for everyone to see at once. Network Infrastructure - In 2017, the school network was upgraded with access points in every classroom to ensure students have high speed access to the internet. Maker Space - The school's new Dream Den opened at the start of the 2018-2019 school year. This versatile space is reconfigured for various STEM activities. Students can build 3D parts, film and produce videos, put programming into practice, and much more using dedicated areas to brainstorm concepts and put ideas into practice. Beyond what is available today, the school technology committee continues to monitor emerging technologies. This ensures that St. Barnabas students remain competitive and best prepared for their future. Our school Maker Space allows us to introduce new technology for students. We are always on the lookout for ways to enhance the learning experience. A recent example is Virtual Reality. A VR cart of 30 headsets was added in January 2018. This is a cutting edge technology that may change the way students learn. Virtual field trips allow students to travel around the world, visit historic sites, crawl inside systems or cells of the human body to understand how they work, or dive far out into space to visualize the wonders of our solar system. Below is a copy of our annual technology roadmap. This is created every January to highlight current and upcoming technology at St. Barnabas.